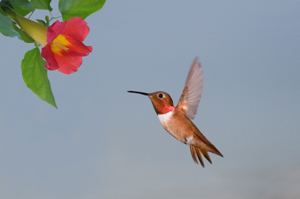 Hummingbird Lovers Newsletter. For the Hummingbird Enthusiast. ....and would like to learn more about them, how to attract them, how to keep them at your feeders, tips and reviews of the latest hummingbird products, discount promotions from our store, festivals, birding tours, and anything interesting relating to hummingbirds that we can find for you, please subscribe to "The Hummer", our monthly e-zine so you don't miss a thing. We will be updating and growing this site with more and more information, tips, news, etc. When you subscribe you will receive a 10% discount promo code for our store and a link to our printable Hummingbird Nectar Recipe.